Joan Beaufort, Countess of Westmorland LG (c. 1379 – 13 November 1440), was the fourth of the four children (and only daughter) of John of Gaunt, 1st Duke of Lancaster, and his mistress, later wife, Katherine Swynford. In her widowhood, she was a powerful landowner in the North of England. Joan Beaufort was the only known daughter of John of Gaunt, 1st Duke of Lancaster, and his mistress Katherine Swynford. The exact year and place of Joan's birth is unknown. She may have been born at the Swynford manor of Kettlethorpe in Lincolnshire or at Pleshy (home of Joan FitzAlan) in Essex. The usual date given for Joan's birth is 1379, but Alison Weir believes 1377 may be more accurate. Joan may have been named for Joan of Kent who was at that time the Dowager Princess of Wales. In 1386, John of Gaunt arranged a marriage between his daughter Joan and Robert Ferrers, 5th Baron Boteler of Wem. The couple married in 1392 and remained in the household of John Gaunt. They had two daughters before Robert died in about 1395. Constance of Castile, second wife of John of Gaunt, died on 24 March 1394. On 13 January 1396, John of Gaunt married Katherine Swynford. In September 1396, the children of John of Gaunt and Katherine Swynford were legitimized by papal bull. In November 1396, Joan married the recently widowed Ralph Neville, 1st Earl of Westmorland. Ralph had twelve children with his first wife and would go on to father fourteen children with Joan. After Joan and Ralph married, Joan's father settled an annuity of £206.13s.4d on the couple for life. The couple's primary residence was Raby Castle, County Durham. In 1399, Joan was made a Member of the Order of the Garter by Richard II. Although Richard II had created Ralph as the first Earl of Westmorland, Ralph sided with Joan's half-brother Henry Bolingbroke when Bolingbroke deposed Richard in 1399 and assumed the throne as Henry IV. Joan and Ralph were granted numerous offices, lands, wardships and pensions under Henry IV. Joan was named in royal grants as "the King's sister." Ralph and Joan used their relationship with Henry IV to seek out the best marriages for their children, often purchasing the wardships of children orphaned by aristocratic rebellions. For example, in 1423, Ralph purchased the wardship of Richard of York, 3rd Duke of York who lived with the family at Raby Castle. Richard would eventually marry Ralph and Joan's daughter Cecily. J. R. Lander called these machinations "the most amazing series of child marriages in English history." By the time of her death, Joan was the mother of an earl, three barons, a countess, three duchesses, a bishop, and a nun. Around 1413, Joan invited mystic Margery Kempe to the family home. It is likely that Joan helped to fund Margery's pilgrimage to Jerusalem. In 1422, Joan acquired an indult permitting her to stay with any order of nuns attended by "eight honest women." After Ralph's death in 1425, the title Earl of Westmorland passed to the son of Ralph's eldest son from his first marriage but much of the family's lands were transferred to Joan's eldest son Richard Neville, 5th Earl of Salisbury. This set off the Neville-Neville Feud which would continue into the War of the Roses. During her widowhood, Joan became a literary patron. Around 1430, Joan and her family were depicted by Pol de Limbourg in the Neville Book of Hours. In 1428, Joan undertook a religious pilgrimage and joined the sisterhood of the abbey of St. Alban's. At some point during her widowhood, Joan swore a vow of chastity. Joan died on 13 November 1440 at Howden in Yorkshire. She was buried beside her mother in Lincoln Cathedral. Joan Beaufort was mother to Cecily, Duchess of York, and thus grandmother of Edward IV of England and Richard III of England, the latter defeated in battle by Henry VII in order to take the throne for himself. Henry then married Elizabeth of York, daughter of Edward IV, and their son became Henry VIII of England. Henry VIII's sixth wife, Catherine Parr, was also a descendant of Joan through Joan and Ralph's eldest son, Richard Neville, 5th Earl of Salisbury, and thus Henry's third cousin. The Earl of Salisbury was father to Richard Neville, 16th Earl of Warwick, "the Kingmaker" (father of Queen consort Anne Neville and Isabel Neville, Duchess of Clarence). Elizabeth Ferrers, 6th Baroness Boteler of Wem (1393–1474). She is buried at Black Friars Church, York. She married John de Greystoke, 4th Baron Greystoke (1389–1436), on 28 October 1407 in Greystoke Castle, Greystoke, Cumberland, and had issue. Joan Neville (b. 1397), became a nun of the Order of St. Clare. Richard Neville, 5th Earl of Salisbury (1398–1460), married Alice Montacute, suo jure 5th Countess of Salisbury. Had issue. Lady Katherine Neville (b. 1399), married first on 12 January 1411 John Mowbray, 2nd Duke of Norfolk; married second Sir Thomas Strangways; married third John Beaumont, 1st Viscount Beaumont; married fourth Sir John Woodville (d. 12 August 1469). Henry Neville (b. 1400), died in infancy. Thomas Neville (b. 1401), died as a child. Cuthbert Neville (b.1402), died in infancy. 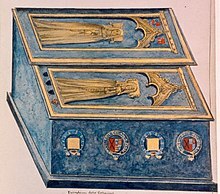 Lady Eleanor Neville (1403-1472), married first Richard le Despenser, 4th Baron Burghersh, married second Henry Percy, 2nd Earl of Northumberland. Robert Neville (1404-1457), Bishop of Durham. William Neville, 1st Earl of Kent (c.1406–1463), married Joan Fauconberg. Lady Anne Neville (c. 1408–20 September 1480), married Humphrey Stafford, 1st Duke of Buckingham. John Neville (b. 1411), died in infancy. Lady Cecily Neville (1415–1495) ("Proud Cis"), married Richard, 3rd Duke of York, and mothered Kings Edward IV of England and Richard III of England. Edward Neville, 3rd Baron Bergavenny (d. 1476), married Elizabeth Beauchamp. ^ a b c d e f g h i j k l m n o p q r s t u v w x y Laynesmith, J. L. (2017-07-13). Cecily Duchess of York. Bloomsbury Publishing. ISBN 9781474272261. ^ a b c d e f g h Weir, Alison (2009-10-06). Mistress of the Monarchy: The Life of Katherine Swynford, Duchess of Lancaster. McClelland & Stewart. ISBN 9781551993201. ^ Weir, A. (2007). Katherine Swynford: The Story of John of Gaunt and his Scandalous Duchess. London: Jonathan Cape. p. 144. ISBN 978-0-224-06321-0. ^ a b c Weir, Alison (2011-04-18). Britain's Royal Families: The Complete Genealogy. Random House. ISBN 9781446449110. ^ a b c d Licence, Amy (2016-03-07). Red Roses: Blanche of Gaunt to Margaret Beaufort. The History Press. ISBN 9780750968683. ^ Collins, Hugh E. L. (2000). The Order of the Garter, 1348-1461: Chivalry and Politics in Late Medieval England. Clarendon Press. ISBN 9780198208174. ^ Press, Cambridge University (2002-12-05). The Cambridge Companion to Shakespeare's History Plays. Cambridge University Press. ISBN 9780521775397. ^ a b c Fritze, Ronald H.; Robison, William Baxter (2002). Historical Dictionary of Late Medieval England, 1272-1485. Greenwood Publishing Group. ISBN 9780313291241. ^ a b c Dean, Kristie (2016-03-15). On the Trail of the Yorks. Amberley Publishing Limited. ISBN 9781445647142. ^ a b Clark, K. L. (2016-09-07). Nevills of Middleham: England's Most Powerful Family in the Wars of the Roses. The History Press. ISBN 9780750969550. ^ a b c McCash, June Hall (1996). The Cultural Patronage of Medieval Women. University of Georgia Press. ISBN 9780820317021. ^ a b Kennedy, Maev; Team, Greyfriars Research; Foxhall, Lin (2015-04-27). The Bones of a King: Richard III Rediscovered. John Wiley & Sons. ISBN 9781118783146. Tuck, A. (2008). "Beaufort, Joan, countess of Westmorland (1379?–1440)". Oxford Dictionary of National Biography (online). doi:10.1093/ref:odnb/53026.